No maps for these territories | gee, can you vague that up for me? 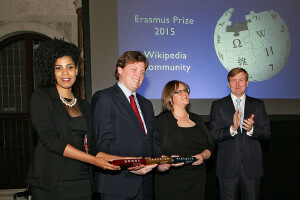 In November of 2015, I had the huge honor of receiving the Erasmus Prize on behalf of the Wikipedia community, along with my colleagues and friends Lodewijk , a long time volunteer, and Adele Vrana of the Wikimedia Foundation. We met the Dutch Royal Family, who were very gracious; we enjoyed fantastic hospitality, and we capped it with a ceremony in which we received a special prize, heard several very good speeches about the meaning of Wikipedia in the world today, and gave some speeches of our own. It was a once-in-a-lifetime, extraordinary evening. Here is some more information, and here what I said. But none of these things are the most astonishing part about this encyclopedia article. The most astonishing part is that it was begun almost exactly fourteen years ago, on 29 November 2001, by one anonymous person. This person visited what was at the time a nearly-unknown website, wrote one sentence about “Erasmus of Rotterdam”, and then clicked “save” for the world to see. And then, over the course of the next fourteen years, over 1.700 different people would contribute to the article to make it what it is today. Some of the changes they made were small — formatting, making a sentence easier to read. Some changes were big: adding new paragraphs, researching sources, taking pictures of commemorative sculptures. These editors used the wiki technology to collaborate on writing the article, but they probably did not know each other’s real names, professions, or countries. But nonetheless Wikipedia’s editors formed a community and built an encyclopedia. They developed structures and guidelines, they argued over what should be in it, and they shared in one great passion: to make the encyclopedia as good as it possibly could be, and to build a world in which every single human being can freely share in the sum of all knowledge. 1995: I met the person I would love for a long time, and it was the last full year my mother was alive. 2000: I rather precipitously moved to California with the person noted above; it was my ticket out of the rural south and ultimately into spending the next 15 years on the west coast. I really got involved in the internet and was both happy and deeply unhappy; I also drove across the country to protests in DC, but that is neither here nor there. At any rate, in the dying days of dot com 1, it was eventful. 2005: goodbye to all that: I had a miracle year, graduating library school and getting my first professional job, not to mention traveling all over Europe and going to the first Wikimania, which was a seminal experience. 2010: I ran a professional conference on wiki research in Poland, and got elected to the Wikimedia Board of Trustees for the first time, both of which seemed like the culmination of a fair bit of work. 2015: goodbye to all that redux: I got hired at MIT and moved cross-country to Cambridge, MA. And I drove across the country again. Major trips seem to be a theme, don’t they? I am not particularly superstitious. And I expect good things and new adventures every year, or at least on balance in most years. I predict 2016 to be a delightful year full of settling into Cambridge and coming into my own at the new job, and I wish for calm and peace and joy for you and yours. But let me just say, I am also looking forward to killing it in 2020. Well, it has been an eventful three months, by which I mean: dear lord, moving is a lot of work. Secondly, I am moved! (Mostly, anyway, see below.) I came here a few weeks ago after a long cross-country road trip with my ever-game Aunt, but then promptly left to go to a lovely Wikimania in Mexico City, where we had excellent sessions and also excellent parties, and I ate a lot of delicious tacos and wandered around the city a bit. Both trips are worth another post. I’m still thinking about the road trip, and the experience of seeing the entire country intimately in two weeks: from Manzanar to Walden Pond, and the highways, small towns, and cities (Las Vegas, Santa Fe, St. Louis, Buffalo) and a few parks (Death Valley, Niagara Falls) in between; a sort of best- and worst- greatest hits experience. As for Mexico City, it’s an infinite, anonymizing city, full of taxis and hidden corners, skyscrapers where everyone who works in them eats tacos off little carts on the street, and the people who make the tacos live in crumbling buildings tucked under roads. The smog is better than it used to be, they say, but still very noticeable; a kind of grit at the back of the throat. Coming from the airport, late at night, we turned a corner past an autobody shop, and there was a park with a Mayan ruin. And, people take their food very seriously; I’ll be thinking about a couple of the dishes I had for a long time. Now, after that series of somewhat surreal experiences, here I am back in Cambridge (Somerville, properly), staying in the lovely apartment of some extremely excellent and generous friends who are loaning me a room for a while, and starting work in a couple days. And I think (cross your fingers!) I have a lead on a fine apartment I can move into next month (the lease is supposed to show up tonight). So, here we are. Nearly done. So: after all that list-making and time-tabling and (this past week especially, ugh) apartment-hunting, and after the general uncertainty and leap-of-faithiness of this summer, I feel like I might finally be getting somewhere on getting re-settled. I’ve made one cross-country move before (though to be fair it was only two-thirds of the country), and I’ve made a few interstate moves since, and I remember the general anxiety before and, for a long time, after. But for most of those moves I was also much younger, with few possessions, and I was with someone else to share the work, and I don’t remember the logistics being awful. (As opposed to, afterwards, dealing with being in a new town and making friends, which was a huge drag and something I struggled with everywhere I moved). This time things are different. The logistics were a pain; coast to coast is nothing to sneeze at, and getting everything to line up took some doing. But I have a gently cushioned landing: I have wonderful friends here who have taken good care of me. I’ve already been to a good party, made family dinners, had a movie night. And I have a job with excellent colleagues, which I’m anxious to start (though truth be told I’m nervous too; even though I know what I’m doing, the first day of school in a new place will never stop being nervewracking). All in all though I feel good about the whole situation. Once I relaxed enough to notice where I was, I found myself walking around Cambridge on a summer evening this weekend, past a park and the old and stately houses, thinking: this is good. It was hard for me to leave Davis. I had half-a-dozen goodbye get-togethers, with various configurations of people. I cried during at least half of them. Saying goodbye to my closest coworkers was impossible, and it’s only OK because we are in the same profession and will see each other at conferences. I was reluctant to leave my house, which I dearly loved. I thought a lot about only having a few more chances to do things, but then when I did things for the last time (driving to San Francisco; going to my favorite stores; eating one last shwarma at the best place; etc.) I barely noticed. But then (and my Aunt, bless her, helped tremendously) — then there was one final party, and the movers loaded everything onto the truck and my house was empty and a little grim, and suddenly it wasn’t mine anymore: just a generic apartment, with nothing special about it at all. And we were off. The first thing I’ve signed up for here as a new resident is my rewards card for frequent buyers at the neighborhood bookstore. I think, all in all, things are turning out just fine.